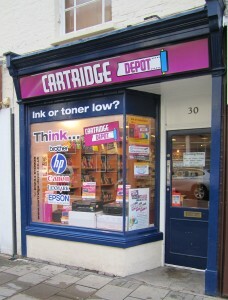 Cartridge Depot is Bedford’s award winning specialist stockist of printing consumables including original, compatible and re-manufactured printer cartridges. 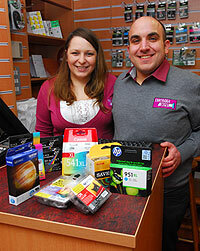 We supply from a shop in St Loyes Street, Bedford for household and business customers alike. We offer our advice help and support on all of the local public’s printing needs using our money saving expertise. Understanding how busy businesses can be we offer a hassle and stress free Business service, if you’re a business find out more about this on our business page. We offer unbeatable service and value for money with a very experienced workforce. Not only does Cartridge Depot help you save money, but we also help you save the environment by recycling your empty printer cartridges. In addition to this we offer a recycling scheme to local businesses, charities and schools returning a donation on collection of empties. The two co founders are Gaetano & Vincenza Ciampa who have a combined 21 years of industry experience. Gaetano has worked 13 years in the industry and has run a similar store for over 4 years, his wife Vincenza has 8 years experience in the industry having worked together in the same store. Using their knowledge and experience from working in this industry they now hope to offer their help, guidance, products and services to customers from their new shop in St. Loyes Street, Bedford. Cartridge Depot understand that customers have different needs and preferences, and so will be stocking original, compatible and re-manufactured cartridges. Alongside the consumables we offer printers and a wide range of printing papers. Donations to local schools, charities, businesses for empty cartridges. We buy certain cartridges back passing our tests and value procedure. Free Delivery service to Local businesses subject to minimum order. We offer an unrivalled customer support and help service on all printing issues and needs. Account facilities for businesses subject to credit checks. Here at Cartridge Depot we understand that customers have different needs and preferences, that’s why we stock original, compatible and re-manufactured cartridges. 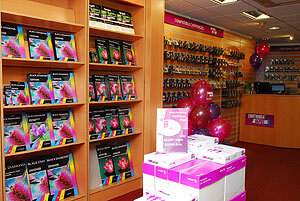 Alongside the consumables we sell printers and a wide range of printing papers. Not only do we specialize in printer consumables, we also specialize in saving you money without compromising on quality, so you can rest assured with our money back guarantee on all our compatible and remanufactured printer cartridges. To help you save even more money Cartridge Depot offer a discount on your purchase of any printer cartridge on return of your empty one. In turn saving you money and the environment, as all empty cartridges are recycled. And what’s more you will be dealing with industry trained specialists who are on hand to give you money saving advice and support on all your printing needs. Not only can you come into our store to purchase your printing consumables, but we can also take orders over the phone and send the cartridges out to you by post. *Postal charges may apply.